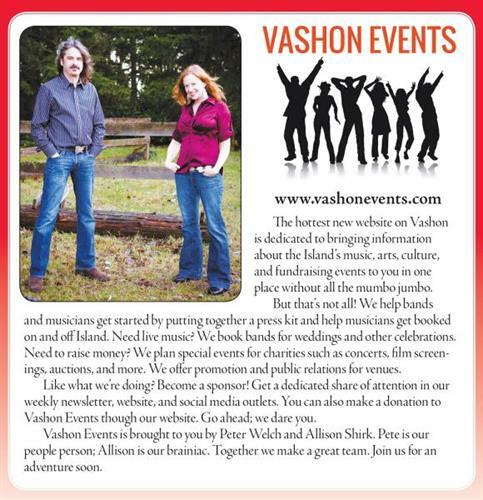 Vashon Events specializes in bringing the diversity of Vashon Island's arts and culture scene to your fingertips by way of calendaring events in a central location that are entertaining, unique, and creative. To hire Vashon Events to organize your next event, concert, of fundraiser, contact us at 206-713-0482 or email vashonevents@gmail.com. Booking - We book bands for weddings, birthdays, parties, bar mitzvahs, barbeques, and - well any celebration you can think of. If you need a band, let us know your basic ideas for your celebration and your event date, if you know it, and give us a shout via email - vashonevents@gmail.com. If you are band who wants to get booked, make sure we know about you by contacting us. You also might want to check our our Band Toolbox. Band Toolbox - We help bands get started by creating a publicity package to market themselves. This includes photography, writing biographies, social media development, and prospect research on potential venues. Do Gooders - We love to think of ourselves as Do Gooders and we want to support others who are doing good in our community. We present and produce charitable events to support our Island's nonprofit organizations and good causes. If you need a grantwriter or events planner, check out Allison Shirk Consulting, LLC at allisonshirkgrantwriting.com.